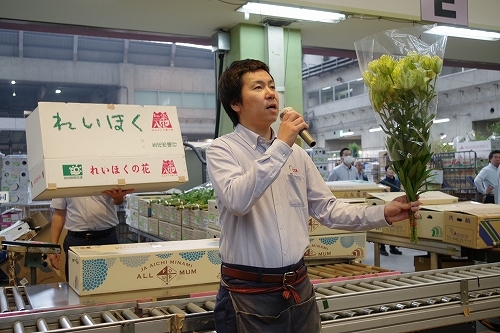 Today I would like to introduce “Aika”, a new variety of Noble Lily, from Tosa-Reihoku Growers’ Cooperative in Kochi prefecture. Noble Lily is unique to this Cooperative, with its main characteristics being a vibrant green color and many petals. No other grower produces it. 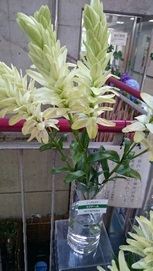 And it was developed based on the Asiatic lily. This Cooperative first tried to grow the Noble Lily about 20 years ago, and now their line-up gradually increases. 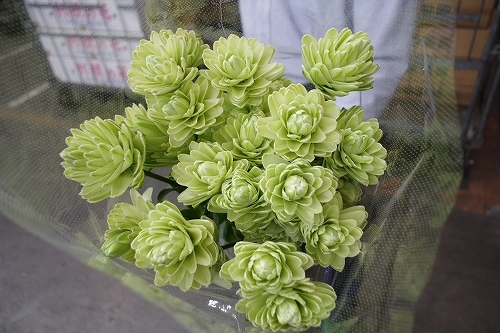 For example, the line-up today includes; “Noble Super”, distinguished by its few spots; “Mimori”, characterized by its thin petals; and “Mimi-tail”, which is characterized by its 20cm flower head length. As these are original varieties, it is difficult to increase the number of seeds and bulbs. Three producers work hard for production of those varieties. 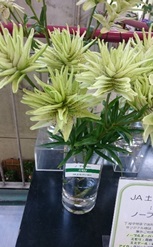 The new variety, “Aika”, has a stronger green color than the Noble Lily, and it has a characteristic in its blooming appearance – less spots and more than 100 petals in one flower head. The rare variety is limited in quantity, but it will gradually increase. 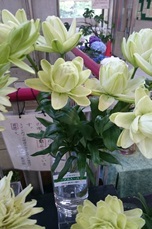 We receive the main product, the Noble Lily, until mid-July and I hope the demand for this flower will continue to expand. Original article written by Mr. Yatsuda.